When you need a reliable workhorse to stand up to a variety of demanding applications, turn to the 200 Series compact track loaders from New Holland. These models hold fast to steep slopes and move easily through muddy or sandy terrain to complete jobs quickly and efficiently. With the patented Super Boom® vertical lift linkage, New Holland compact track loaders provide you with some of the best breakout forces and dump heights in the industry. Turbocharged engines feature externally cooled EGR (exhaust gas recirculation) for efficient air handling and high engine power density with the shortest load response time. Optional sealed cab minimizes noise and dust. The full-view windshield provides an outstanding view. A heater/defroster kit and optional air conditioning allows you to control the climate in any weather. 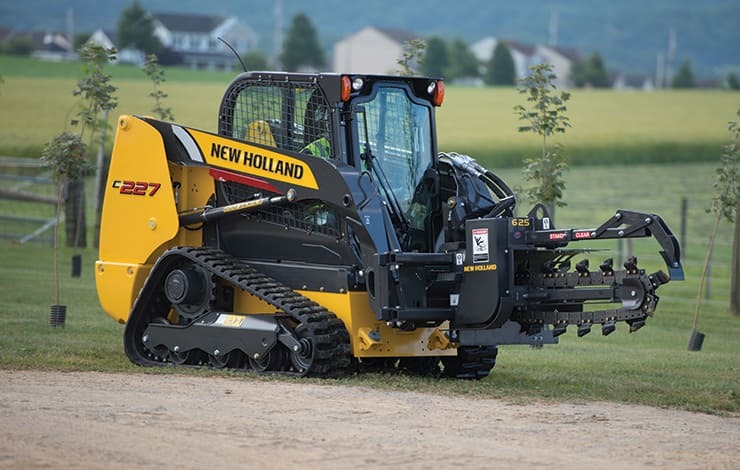 New Holland’s low-profile undercarriage design uses steel-embedded tracks that roll on rubber instead of steel to give you a smoother, quieter ride and longer-lasting tracks. The undercarriage design has fewer moving parts than competitive designs, and the simplified carrier design includes more open areas to improve track cleanout and extend track and carrier life. Lifetime sealed and lubricated rollers and idlers reduce your maintenance costs.